CultureSource, the Detroit-based alliance of arts and culture non-profit organizations in southeast Michigan, today announced Omari Rush as executive director. In his new role, Rush will focus on improving advocacy, capacity building, communications, and membership services efforts. In his most recent role as vice president of strategic initiatives at the Ann Arbor Art Center, Rush was responsible for growing the organization’s financial capacity and resources, managing highly visible public arts projects for the city of Ann Arbor, and supervising the development staff. Prior to this role, Rush served in several other leadership positions at the the Ann Arbor Art Center center, including director of external relations and curator of public programs. Before joining the Ann Arbor Art Center in 2014, Rush worked as educational manager of University Musical Society at the University of Michigan. Rush earned a bachelor of music from Florida State University and a master of music from U-M. Rush is currently involved in many arts and culture organizations around the country. He is on an advisory committee for the Association of Performing Arts Professionals in Washington D.C in addition to being a member of the Next Generation of Philanthropists of the Ann Arbor Area Community Foundation. 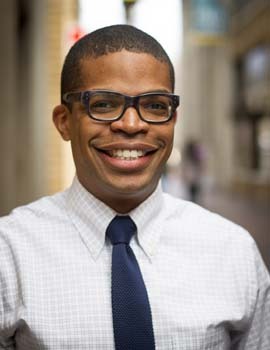 He has served as vice chair for the governor-appointed Michigan Council for Arts and Cultural Affairs since 2013 and is on the board of directors for the Washington D.C.-based National Assembly of State Arts Agencies as well as Minneapolis-based Arts Midwest. Rush also writes a monthly digital magazine column featuring art activities in Washtenaw County called “Essential Arts Events” and is a co-host of the monthly WEMU radio program “Art and Soul”, which highlights artists, exhibitions, and visual arts events in Washtenaw County.